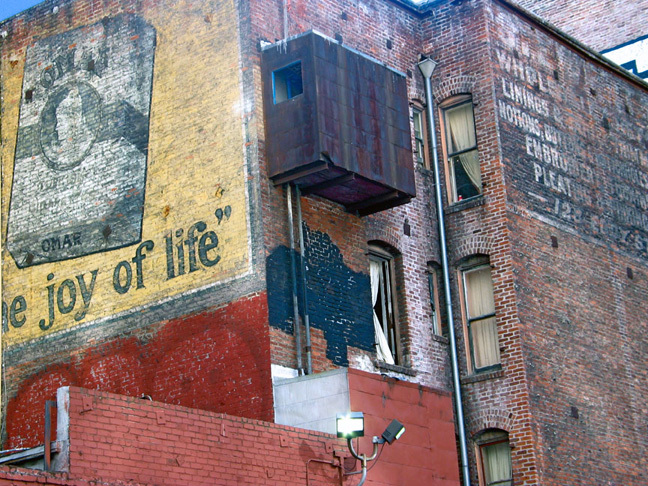 Do you have any photos along Ellis Street that encompass 181 Ellis? In the 1960s this was the address for “The Horse & Cow,” a tavern according to Polk directories (which give alternative and probably incorrect address of 101 Ellis). I don’t have any photos of that particular block and am not familiar with The Horse and Cow. What is the year of your directory? for example, and shows erroneous location. I’ve noticed other artifacts like this for “The Antique Room” being changed to “The Ante Room” with this mistake migrating through succeeded publication years. It would seem to be a product of the Polk directory canvassers rushing through their telephonic interview to confirm the business or individual still occupied the same address. “The Horse and Cow” was owned and operated by the Looby brothers. By my research, it operated from as early as 1963 through 1970 before moving to Hunters Point. It was a bar that catered to Navy submarine sailors (a very select clientele) and has a rowdy reputation. Its principle attraction was the accumulation (like Tommy’s Joynt) of submarine paraphernalia that lined every wall. Its popularity grew, and it spanned out into branches in Navy towns that had submarine facilities (on Ellis, on 3rd near Hunters Point, Vallejo, San Diego, Bremerton, Guam). I’m just over the moon to see the photograph from 1905 of the Native Sons Monument at Market and Mason! 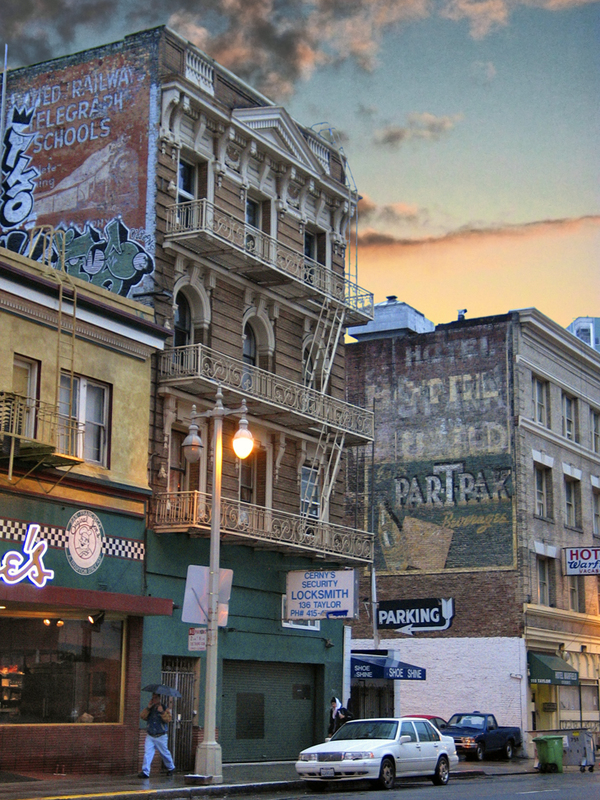 Or rather, more specifically, the building in the background described as “…the mansard-roofed Golden State Hotel above Spider Kelly’s saloon…” From 1889 to 1894, my grandmother’s aunt, Nancy T. Ready, was the proprietor of the Golden State. This is the first photograph of it that I’ve ever seen, and I’ve been doing research on Aunt Nan’s life for several years now. Is there anything more that’s known about the place? I have something about Spider Kelly buried somewhere in my notes. If I can find it, I’ll publish it as an addendum to this comment. As to the hotel itself, I don’t have any additional information. Very cool that a relative of yours was the proprietor of the Golden State! Thanks for writing. Hi. 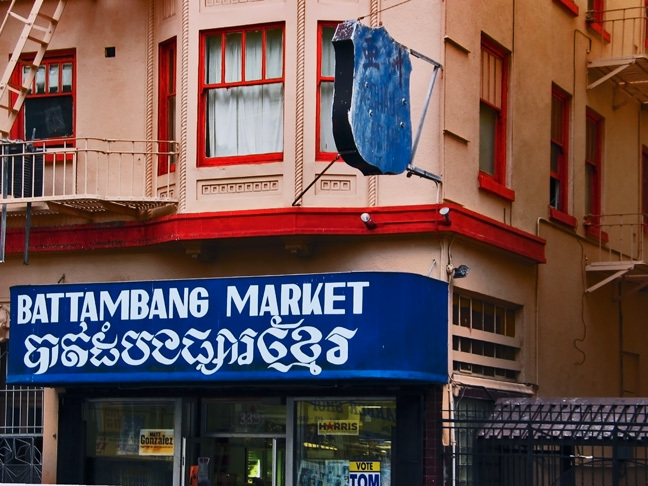 I love this site and everything that has to do with the Tenderloin’s history. I was wondering, is 450 Jones – aka the Abbey – considered a Historic building? Thanks. The Abbey — originally the Athmore Apartments (1909), renamed the Abbey Apartments in 1982 — is indeed listed in the National Register of Historic Places. Hi there, love the website. Just found it but will be coming back to take it all in. What brought me here today was trying to find out more info about a SF hotel that is probably long gone. I purchased some old books and a business card was inside one of them, for a “Z. Maloof”… the manager of the Hotel Rosslyn at 44 Eddy St. It shows the daily rate as 75 cents and the weekly rate as $3.50. The phone number is just “BROOK 6409”. On the back of the card written in pencil is the date 8-14-39. I was curious to learn more about the Rosslyn but cannot find much online. Can you or any of your readers shed any light? Thanks in advance. 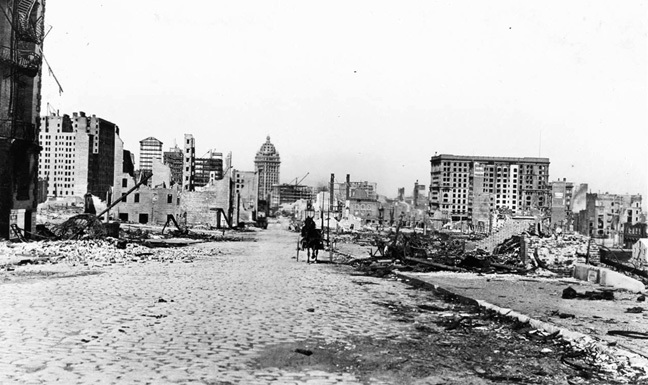 the Rosslyn was demolished many years ago, back in the ’70s. There’s now a parking lot where it once stood. More than that, I can’t tell you. Very interesting website. What brought me here today was a search for info on a SF hotel. I bought some old books recently (not to read, but “antique looking” books to put on a shelf) and a business card was in one of the books. It’s for “Z. MALOOF”, the “MANAGER” of the “HOTEL ROSSLYN”. The address is “44 EDDY STREET” and the phone number is “BROOK 6409”. Other text on the card: “ALL OUTSIDE SUNNY ROOMS”…”TRANSIENT, WEEKLY AND MONTHLY RATES”…”WEEKLY RATES $3.50 UP”…”DAILY RATES .75 UP”. On the back written in pencil is “8-14-39” It’s in perfect condition, not a blemish on it. I’m guessing it’s been inside that book for many many years. I haven’t been able to find much on the Rosslyn. I did get a few hits on some legal trouble Mr. Maloof had in 1945 for overcharging. Do you happen to have any information on this hotel? Thanks in advance. The Rosslyn was next to what was once the Tivoli Theater. That block of Eddy was completely redeveloped in the ’60s and ’70s, and except for the Tivoli, I’ve done no research on it. Sorry I can’t be of assistance. Wonderful site! I learned so much in such a short time. 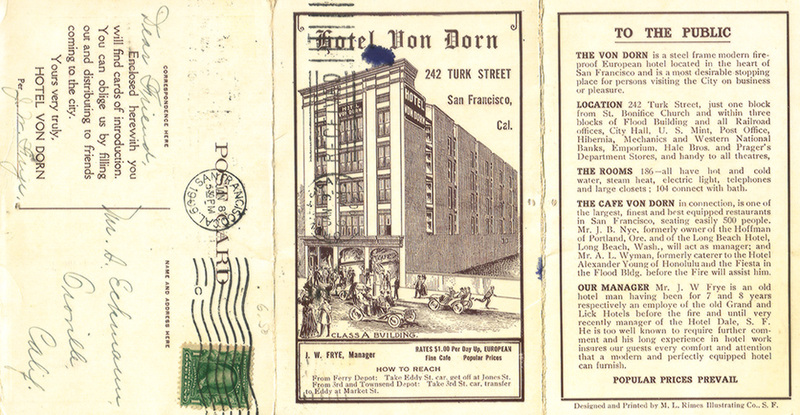 Was the former Ramona Hotel at 174 Ellis Street considered part of the Tenderloin district? If so, do you plan on covering this hotel’s history? Thank you! The Hotel Ramona lies just outside the Uptown Tenderloin Historic District, Damienne, but I do have a fair amount of historical info, including photos and postcards, and will eventually include that in Part Three.